In late 2008 I attended a Sony Australia media event and was interested in the newly launched Sony MDR-NC500D Digital Noise Canceling Headphones. Finally a week ago they sent me one on loan to tryout and review. I’ve always been interested in Noise Canceling headphones because I like to listen to podcasts and music on public transport like noisy trains and buses without having to turn the volume up so high that I’ll go deaf. VERDICT: These are the best noise cancelling headphones I have tested to date. As I write this review I’m listening to some streaming internet radio and using the #3 setting (Office environment) and the noise cancellation is quite effective – I can’t hear all the noisy fans in my computer at all. Every time you hear a really loud sound, your hearing acuity decreases. Thankfully, the effect usually isn’t permanent – audiologists refer to it as temporary threshold shift – but repeated exposure to high volumes will likely reduce your hearing ability. If you occasionally experience ringing in your ears after listening to loud music or other sounds, take heed. Nature’s telling you to turn it down. If you don’t, you will suffer some hearing loss – and you’ll never get it back. That’s why it’s a bad idea to block out external noise by cranking your portable audio device’s volume up to 11. Noise cancelling headphones alleviate this widely ignored problem. Noise cancelling headphones enable you to hear your music without blowing out your eardrums. The NC500D has 4 noise cancelling settings in total (Automatic and 3 manually set modes) which is a unique feature as far as I know. All the other headphones I’ve tested or owned in the past have had 1 fixed built-in noise cancelling profile. A powerful processor inside the NC500D headphones automatically adapts the cancellation profile to suit the characteristics of ambient noise. In normal use, when the ‘Select’ button is pressed, the headphones will automatically select from three cancellation modes to suit the surroundings – whether on an aircraft, a bus or train, or in the office. Alternatively, pressing down and holding the mode switch allows the user to manually select the cancellation profile that is most effective in their environment. As I mentioned in my “Verdict” at the top of the review these headphones are not cheap – the recommended retail price is $AUS799 and the cheapest price I could find via the Shopbot price comparison website was $AUS422+postage, I imagine a retail store would charge at least $AUS500. 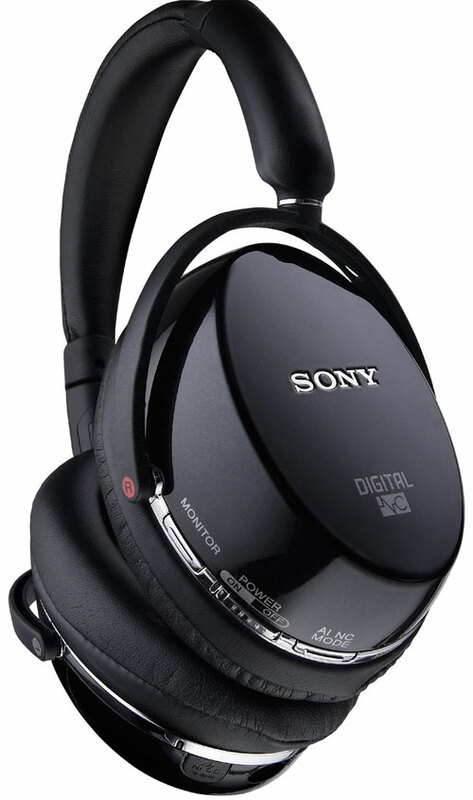 American readers are advised to buy Sony MDR-NC500D’s from Amazon.com who offer free shipping. Yes there is an alternative to use a different cord with ‘AAA’ Battery holder but I found that kind of cumbersome when walking. The carry case does contain all the different cables and the AC Adaptor but surely they could have made it a bit smaller? WIRED: Noise cancellation is adjustable to your environment and a monitor switch is handy for temporarily hearing external sound. And external battery box is handy when the built-in batteries wear out but they work nonstop for half a day without a recharge. TIRED: Handy external battery box adds to the weight and bulk of the protective carrying case as does the power brick also enclosed. Some bass sounds played at high volume cause ear splitting distortion. There is not much we don’t like about these headphones, apart from the painfully high price tag. The Sony MDR-NC500D noise-cancelling headphones do a fantastic job of blocking out repetitive ambient noise. When listening to music they also acquit themselves well, with clear sound and a pleasant character. I’m currently 30,000 feet above the Atlantic in a Boeing 747 and I can’t hep but gush over these headphones. They’re simply amazing. But are they worth the price? For most people I would say no way. I think these are only for those frequent flyers who are regularly taking flights longer than 5 hours. The Sony MDR-NC500D Digital Noise Cancelling Headphones may lighten the wallet, but they are a great option for frequent fliers and tetchy commuters who need superior noise cancellation. Make no mistake – these are great headphones in all respects. Splendid audio, and excellent noise canceling. They are comparable to the Bose Quiet Comfort 2 headphones in almost all respects, except one – they are $100 more expensive. They also have inferior battery life and the added encumbrance of either an external battery pack or the need to travel with a power charger. These look like some seriously sweet headphones but I don’t know about that price tag. Good design is one thing but man, that’s steep. How about the sound quality of this headphone as compared with the other noise canceling headphones such as the JVC’s HANC250? @Adi Gui . The JVC’s HANC250 are fine but definitely I would go for Sonic’s , even if the JVS’s are cheaper. How about the sound quality of this headphone as compared with the other noise noise isolating such as the Triplefi 10?